The cranial nerves connect the muscles and organs of the head and body directly to the brain. Let’s face it. (Ha!) There’s a lot going on in (and on) your head at any given time. Your eyes gather information about light, your ears collect sound waves, and your nose detects odorants in the air. Your tongue tastes your food. 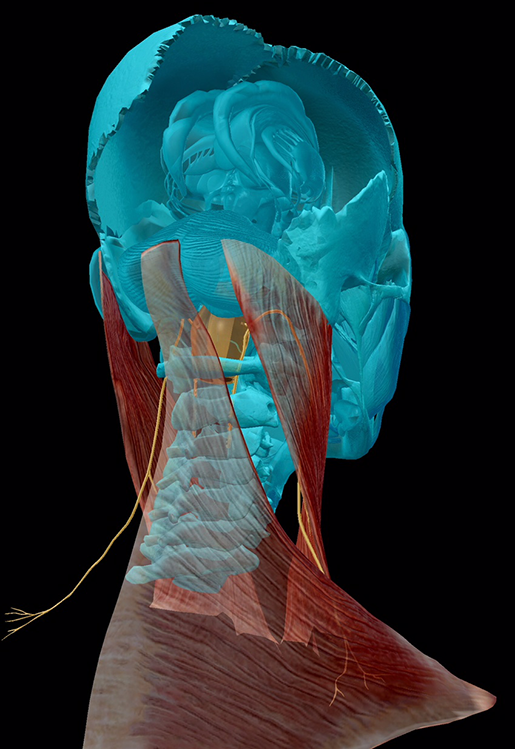 A vast array of muscles stand ready to help you communicate with others using speech or facial expressions. What keeps these busy muscles and organs doing their thing? In large part, the cranial nerves. There are 12 pairs of cranial nerves, and each has a unique function and sensory and/or motor designation. Fortunately, anatomists have numbered the cranial nerves for everyone’s convenience. 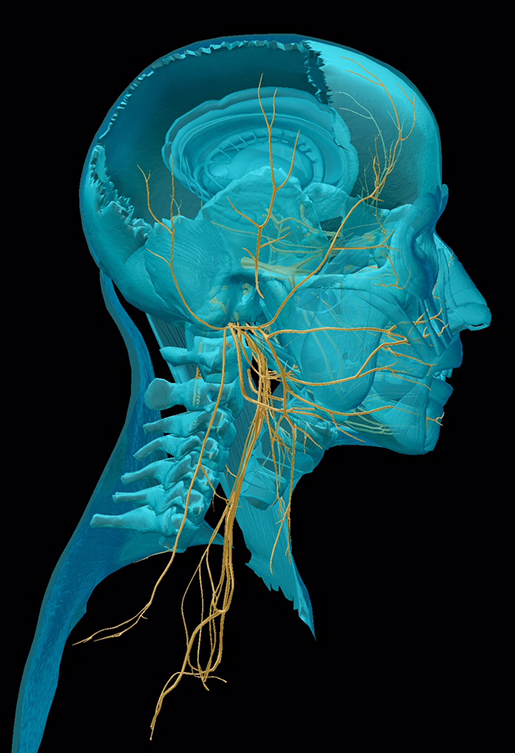 Like the spinal nerves, the cranial nerves are part of the peripheral nervous system. However, their connection with the central nervous system is largely through the brainstem (midbrain, pons, and medulla oblongata) instead of the spinal cord. As you might have guessed, today’s blog-venture is going to be a whirlwind tour of the cranial nerves. There’s a lot to cover, so let’s get going! 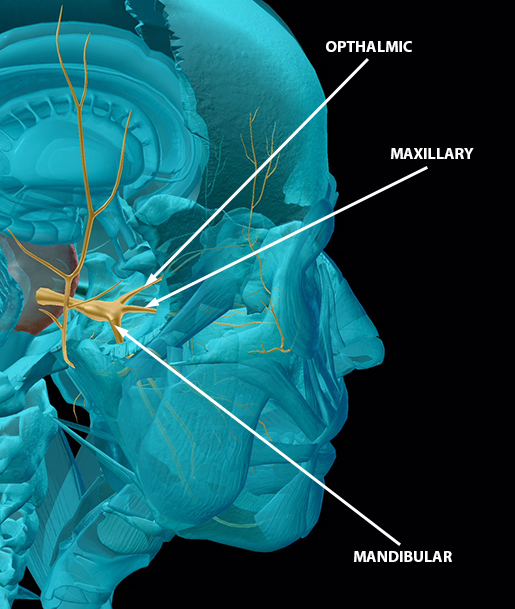 The olfactory nerve is a sensory nerve running from the nasal epithelium to several different structures in the brain. Specialized neurons that hang out in the nasal epithelium detect molecules called “odorants” in the air and transmit information about them up to the olfactory bulbs, which sit on top of the ethmoid bone. Structures called olfactory glomeruli in the olfactory bulbs transfer the sensory information to the olfactory tracts, which then carry it to several different areas of the brain, including the amygdala, hippocampus, septal nuclei, and primary olfactory area of the temporal lobe. If you’re reading this article, you can thank your optic nerves. When light enters the eye, it is detected by special cells in the retina called photoreceptors. The information these cells collect is transmitted back to the brain via the optic nerve. You might already know that the right visual cortex (the part of the occipital lobe where visual processing begins) receives information mostly from the left eye and the left visual cortex receives information mostly from the right eye. The optic chiasm, the first brain structure reached by the optic nerves, is where this “crossover” happens: some fibers from each optic nerve cross each other, while others continue on to deliver their message ipsilaterally. After the optic fibers reach the lateral geniculate nuclei in the thalamus (each hemisphere has a lateral geniculate nucleus), the signal passes to the primary visual cortex in each hemisphere. The "x" shape of the optic chiasm gives it its name! Image from Human Anatomy Atlas. The oculomotor nerve controls the intrinsic and many of the extrinsic muscles of the eye. 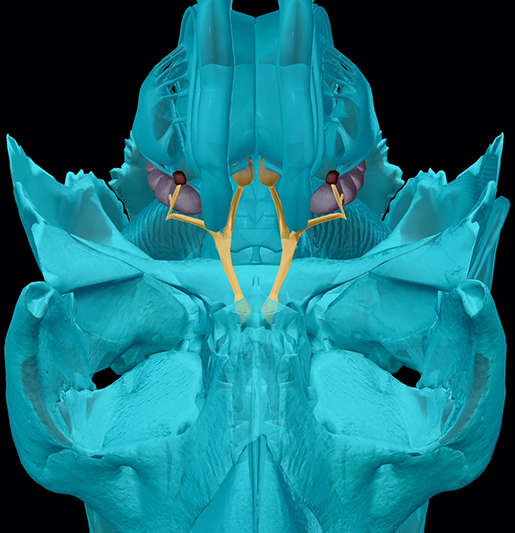 It extends from the midbrain through the superior orbital fissure of the sphenoid to the orbit and splits into two branches. 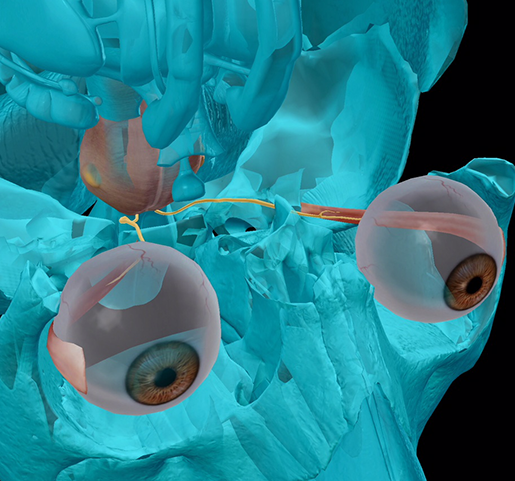 The superior branch innervates the superior rectus and levator palpebrae superioris (upper eyelid) muscles. The inferior branch innervates the medial rectus, inferior rectus, and inferior oblique extrinsic eye muscles. Fun bonus fact! The oculomotor nerve serves the parasympathetic nervous system functions of constricting the pupil to regulate the amount of light entering the eye and adapting for short range vision by contracting the ciliary muscle (one of the intrinsic eye muscles). Like the oculomotor nerve, the trochlear nerve travels from the midbrain through the superior orbital fissure of the sphenoid to each orbit. It innervates the superior oblique muscle of the eye, which controls the eyeball’s up and down movement. Interestingly, although the trochlear nerve has the smallest number of axons of any cranial nerve, it has the longest intracranial course. 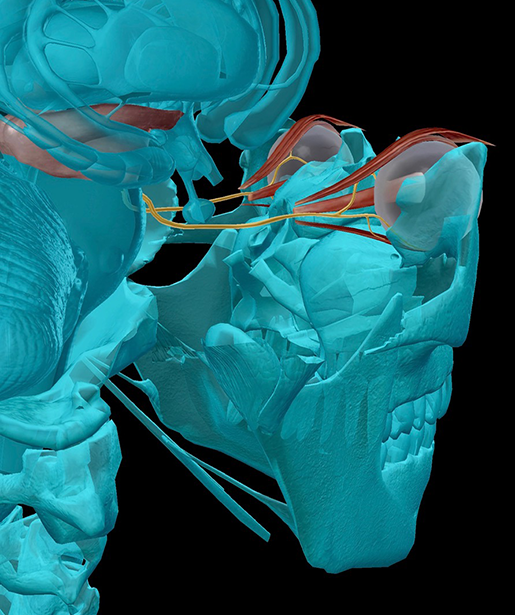 The trigeminal nerve is a big one. It originates in the pons and has three branches: the opthalmic branch, the maxillary branch, and the mandibular branch. It’s also a mixed sensory/motor nerve, which means it has fibers that deliver sensory information to the brain and fibers that carry commands for muscle contractions. The sensory fibers receive information from mucous membranes, sinuses, and the skin while the motor fibers control the muscles of mastication and the pharyngeal arch. Did you know that sensory signals from the trigeminal nerve (and not the olfactory nerve) prompt sneezing? The fibers of the abducens nerve originate in the aptly named abducens nucleus in the pons. This nerve always makes me think of giving people “side-eye” because it innervates the lateral rectus muscle, which is responsible for the lateral rotation (abduction) of the eyeball. 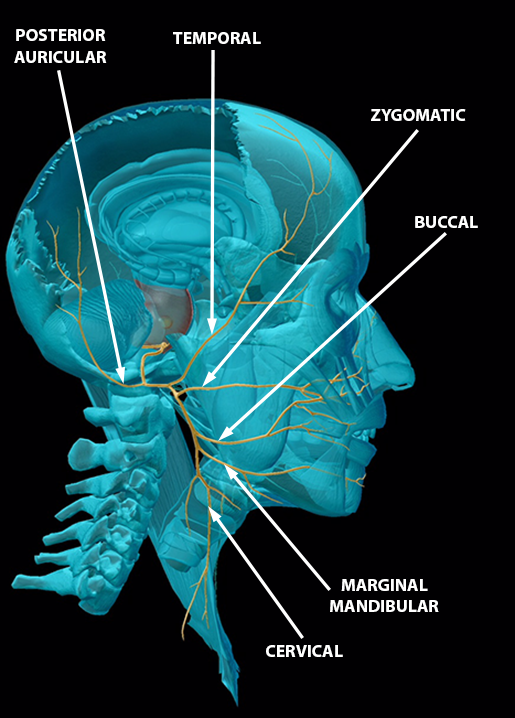 The facial nerve has a LOT of branches, and by a lot, I mean five main ones: temporal, zygomatic, buccal, mandibular, and cervical. It also has a posterior auricular branch, which innervates a portion of the occipitofrontalis muscle. Like the trigeminal nerve, it contains both sensory and motor fibers. 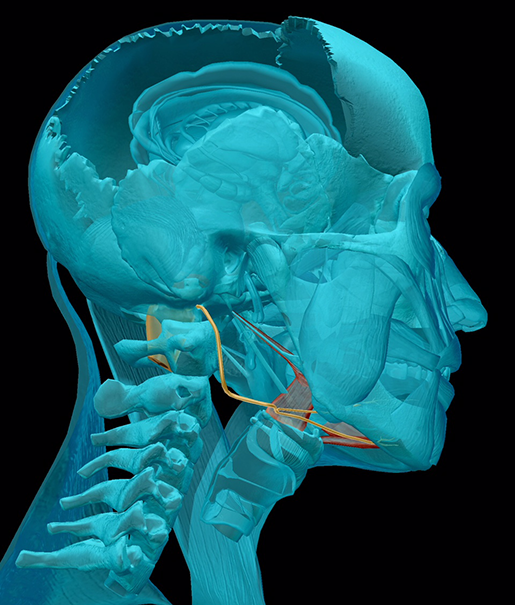 The sensory fibers receive input from tastebuds on the anterior portion of the tongue and proprioceptors (receptors sensitive to position and movement) of the face and scalp. The motor fibers innervate muscles in the face, scalp, and neck, as well as the stapedius muscle in the ear. They also innervate mucous glands in addition to the lacrimal and salivary glands. The vestibulocochlear nerve may not have as vast a network of branches as the facial nerve or trigeminal nerve, but its two branches serve two very important functions. 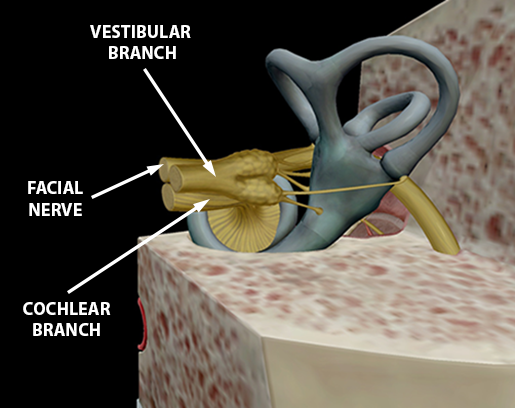 The vestibular branch transmits information back to the brain from the vestibule and semicircular canals in the inner ear to help regulate equilibrium. The brain areas that receive this information are the vestibular nuclei in the pons and medulla oblongata. 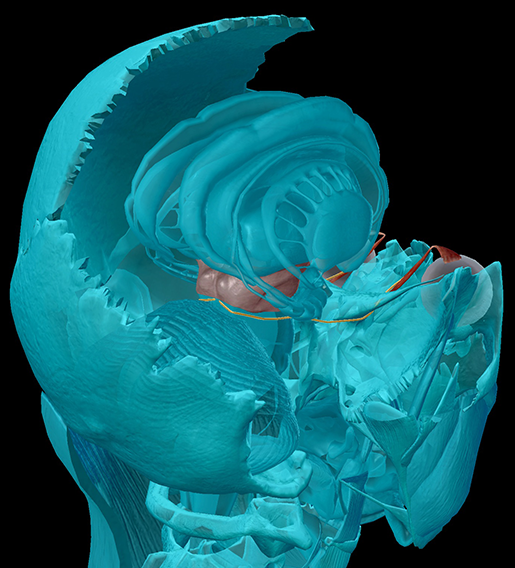 The cochlear branch receives information about sound that has been gathered and translated into electrical impulses in the cochlea (the seashell-looking structure of the inner ear). Ever heard of an ABR (auditory brainstem response) hearing test and wondered what the brainstem has to do with hearing? 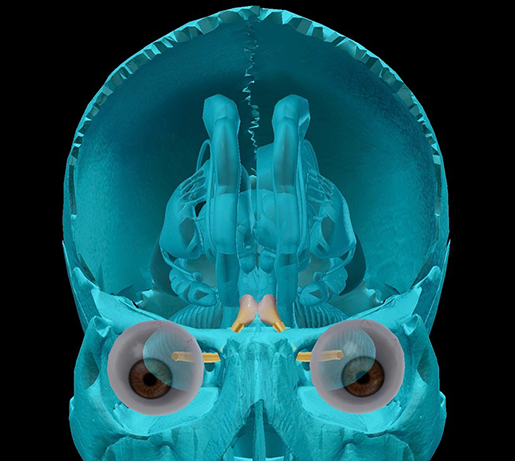 Although there are cortical areas dedicated to sound processing, the cochlear nerve’s destination is the cochlear nucleus of the medulla oblongata, which means that the first information about sound that reaches the brain comes through the brainstem. Cool, right? 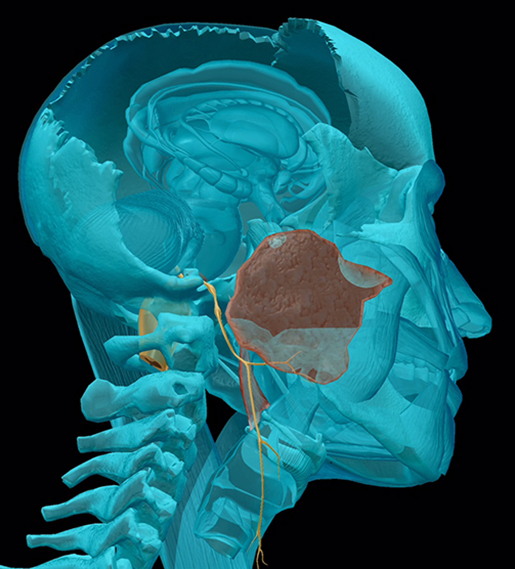 The glossopharyngeal nerve is a mixed sensory and motor nerve important to swallowing. Its motor fibers innervate the stylopharyneus muscle (which elevates the pharynx and larynx) and the parotid salivary glands. It receives sensory signals from the proprioceptors of the swallowing muscles, baroreceptors (pressure sensors) in the carotid sinus, and chemoreceptors in the carotid body. Also, since the glossopharyngeal nerve innervates the oropharynx, it is the initial recipient of the information that triggers the vagus nerve to produce the gag reflex. Ew. 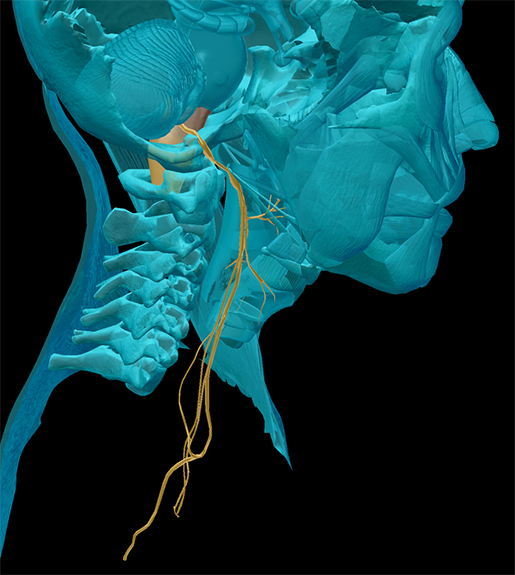 The vagus nerve is a well-traveled and crazy-busy polymath. You might think that innervating the muscles of the pharynx, larynx, and soft palate and receiving sensory input from the external ear, tastebuds in the pharynx and epiglottis, and proprioceptors in the throat and neck is enough, but just wait—the vagus nerve keeps going! It’s got branches in the thorax and abdomen that are key to the parasympathetic nervous system’s regulation of heart rate, sweating, breathing, and even the movements of the smooth muscles of the gut. And have you ever heard of the vasovagal response or vasovagal syncope? Well, the vagus nerve is in charge of vasodilation (dilation of blood vessels), which causes blood pressure to drop. In combination with a reduction in heart rate, this low blood pressure reduces the amount of blood that can get to the brain, resulting in fainting. Do you enjoy moving your head? If you nodded “yes” to that question, you just experienced your accessory nerve in action! The accessory nerve innervates the sternocleidomastoid in the neck (a primary mover in neck flexion) and the trapezius in the shoulder (a primary mover in neck extension). Last but not least, we have the hypoglossal nerve which, true to its name, travels under (hypo-) the tongue (-glossus). The hypoglossal nerve controls the intrinsic and extrinsic muscles of the tongue, with the exception of the palatoglossus (which is innervated by the vagus nerve), so it’s incredibly important for speech and swallowing. Literally. Let’s make a table out of it, so you’ve got a handy reference guide for all these cranial nerves! Want some handy mnemonics to remember the names of the cranial nerves and which cranial nerves are sensory, motor, or both? For the names of the nerves, you can use this one from Saladin's textbook: Oh, Once One Takes The Anatomy Final, Very Good Vacation AHead. For sensory vs. motor, try: Some Say Marry Money, But My Brother Says Big Brains Matter More. Saladin, K. (2015) Anatomy & Physiology: The Unity of Form and Function. 7th ed. McGraw-Hill. McGill University - The Brain From Top to Bottom.